I used to frequent that strip near the legendary Guitar Center in that incognito stretch on Sunset Boulevard. Post-college it was late night snacks (or entrees) at Bossa Nova eating what they dubbed “Brazilian food.” I’m not saying it’s not; I’m just saying that it was the widest and most diverse cuisine I ever got to know based on Bossa Nova’s menu, alone. And then there’s Toi, with their sit-down, fast food Thai. That favorite shirt imported from Japan that I still wear from Pop Killer. Never did get to try Cheebo. But my reasons for revisiting the area have been renewed. Vintage Enoteca is now on the block offering small bites ($5), bruschettas ($6), paninis ($10), salads ($8), flatbreads ($10) and of course cheese and salumi (3 for $10, 5 for $13) to pair with your wine. The prices won’t make you wince and they offer wifi so your laptop, not just your wine, can keep you cozy. La Brea Bakery bread provides the foundation to their bruschettas and paninis, so you can rest assured they’ve proper foundation. But the best news is, the eats are comforting. 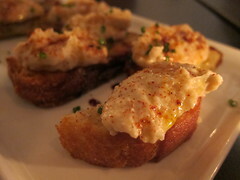 Ask for the appropriate pairings for each bite – such as the Walter Hansel ’09 Sauvignon Blac, which compliments the White Bean Hummus Bruschetta beautifully. Or try the Charles Smith ’07 Cabernet to wash down your Medjool Dates. Despite the unfortunate deli and lunch meat stigma tuna salad gets, it was astonishing how good their Italian Tuna salad was, with spiral fusilli tossed with artichokes and cherry tomatoes in a lemon mustard vinaigrette, topped with pecorino. 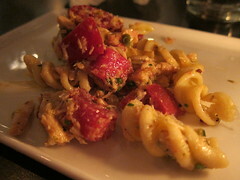 It’s a vibrant dish with much thanks to its fresh ingredients – the pecorino accented the tuna perfectly. If you’re looking for something with a little more weight and spice to it, try the Spanish Grilled Cheese, made with chorizo, fontina cheese and piquillo pepper. Pair it with the ’08 “Les Chevrefeuilles” Grenache/Syrah from CÃ´tes du RhÃ´ne. The flatbreads Vintage Enoteca offers aren’t so shabby, either. 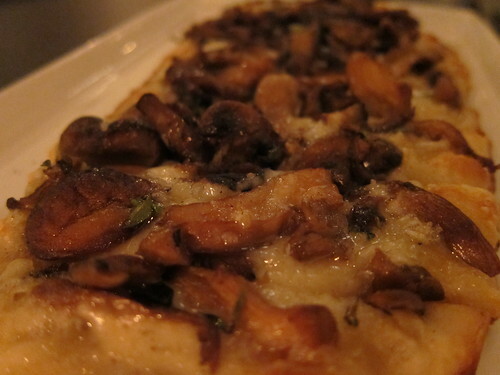 My favorites were the Cauliflower, topped with prosciutto, bÃ©chamel and gruyere; and Mushroom, with its perfectly roasted variety of mushrooms, fontina and thyme. Whatever your occasion to drink wine at Vintage Enoteca, it’ll be pleasantly casual and yet perfectly delicious. P.S. – Purse hooks are welded underneath and to the right of each metal table place setting. 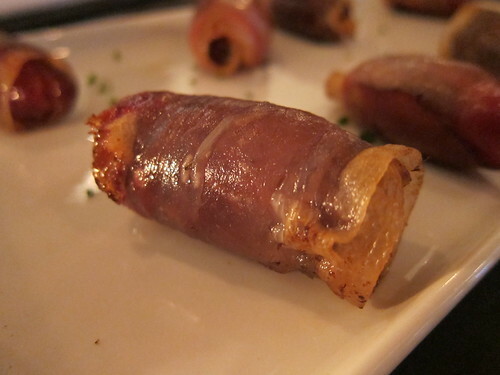 This entry was posted in beer, Food, West Hollywood, wine and tagged beer, bruschetta, flatbread, Hollywood, small plates, sunset blvd, Vintage Enoteca, West Hollywood, wine bar. Bookmark the permalink.